Last summer Matt and I stumbled upon this badass little coffee shop in downtown Hamilton, ON. Steeltown Garage Co. You walk in and can immediately smell the wood grain from the shelves, the leather of their riding gloves and freshly ground coffee. 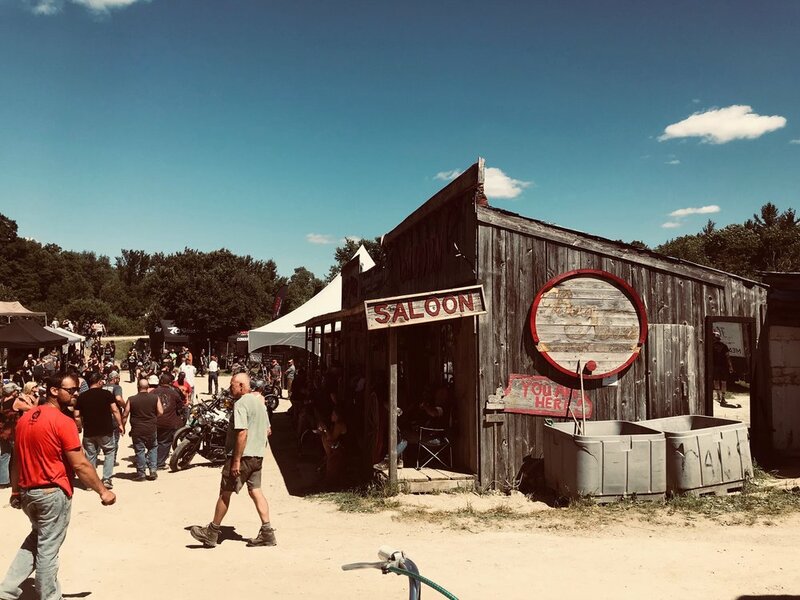 After chatting with one of the owners, Tanya, she told us about a motorcycle show happening the following month at Frontier Ghost Town in Bruce County. We bought tickets purely based on her stories of the place and the amazing price (only $20!!) Little did we know this was about to become our favourite show! When you first pull up to Frontier Ghost Town you are immediately thrown back in time to an old saloon town. Wooden shacks covered in rusty road signs and wagon wheels lined up along the dirt roadways. 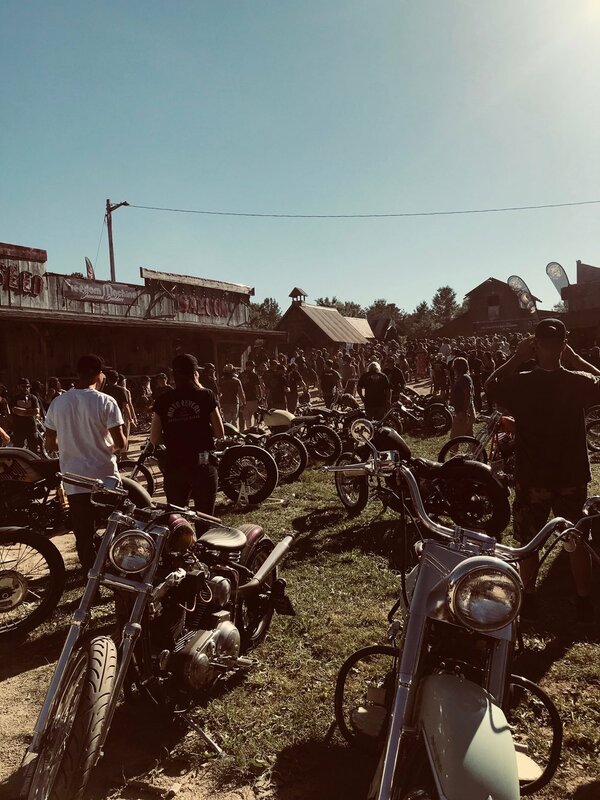 Covered in black bandanas and tattoos, there are just as many people parked in front of these shacks as there are motorcycles. We must have spent atleast 8 hours walking around looking at bikes, people watching and checking out the vendors selling t-shirts, paintings, posters and handmade soaps. As we were just about to head home, we heard a man come on over the loudspeaker announcing that the motorcycle giveaway was about to happen! Turns out that an entire team of badass builders came together to create a custom made bike to give away to one of the lucky show-goers. Once they called your name you had 2 minutes to get to the stage or they would call another name. Everyone swarmed to the stage. Having been to a handful of concerts and bike shows, I expected this crowd to be rowdy. (In large crowds I kind of just expect there to be some kind of scuffle these days..) I expected that when they called the name of a man with a bit of a limp standing at the very back of the event, the crowd would keep their elbows up and keep him from getting to the stage in time. Instead, the crowd parted right in half and every single person high-fived the man and cheered. He slowly made his way too the front yelling “it’s me!” with both hands straight up in the air. In a dirt field full of tough looking men and cigarette smoke, this was such an amazing thing to see. At the end of the day we went home covered in dust with our eardrums ringing and felt so lucky to be a part of what we just were. We will absolutely be back again this year, hopefully with some bikes of our own. You can find information on the show at https://www.freedommachineshow.com/ and find out where your local ticket supplier will be. You don’t want to miss this.